When we are young and poor, a million dollars seems an enormous sum – enough to cure all the ills in our lives! If you are working at becoming a millionaire, perhaps you dream about the mansion you will buy and the servants you will have, the vacations you will take and the interests you will pursue. Do you imagine that your life will be so much better, so much different by having a cool million or so? My spouse and I were that young, poor couple, sloughing away at our day jobs and scrimping and saving for years to build wealth. You can read more about my story – the things I did and the things that I believe would have made our journey easier and faster – in Choose Wealth! Be a millionaire by midlife. I remember going through magazines and catalogs picking out the things I would have when we had money. I remember thinking about how wonderful it would be to not have to worry about whether we had enough to pay for the propane gas to heat our home. I watched the rich people around and on TV, wondering if I would be like them if I were wealthy. Well, we made it and here are some of the surprising things I found out about having a few millions. You still want to do your best at work. Some might find it surprising that a millionaire would want to keep working. I found that I wasn’t really working for the money (although I wouldn’t have done the work without being paid! ), but rather for the satisfaction of making a positive contribution with my time and effort. A fulfilled life, to me, is a life of accomplishment. Setting goals and reaching them continues to be enriching and satisfying to me. Managing your finances gets a lot more complex and time consuming. Gone were the days of having one bank account and only having to keep very simple records. Millionaires contend with multiple types of investments at multiple investment firms with multiple types of advisors having a hand in it. Your life won’t magically change for the better. Your life is your life. You can do the things you want and need to do whether you have money or not. If you take care of your health and relationships when you are poor, you will most likely continue to do so after reaching a million (and vice versa). Your marriage won’t suddenly get stronger. You won’t instantly lose weight. You don’t all of a sudden become a genius. Granted, some things get easier to do. You have less risk in trying something new when you have financial backing. You can hire others to help you do what you don’t like to tackle. You don’t have to contend with deciding which bill to pay or how to avoid a debt collector’s call or trying to keep the landlord off your back. You won’t become a different person. My lifestyle didn’t change. My basic personality and approach to life and others has remained the same. My pinkie finger didn’t suddenly start reaching for the sky while sipping champagne. I didn’t start dressing differently or acquire new friends or treat my relatives better or more poorly. I didn’t start getting my body redone with plastic surgery or face lifts. Being thrifty stays an ingrained habit. Many millionaires, me included, spend years of their life working and building up their wealth to reach the point where they have those millions. In doing so, many become adept at thriftiness. It is a habit acquired through long practice and is one that stays with you even after you build wealth. I still think twice about spending money and I still shop for the best bargain. I hate to be taken advantage of in a financial transaction, just as I did when poorer. Having enough money can remove stress from your life. Knowing I had the financial backing to live through negative life events (divorce, job loss, catastrophe, etc) removed a level of stress from my life. I used to worry about what would happen to my kids if my spouse decided to move on. Would I have enough to house, feed and clothe them? After reaching a level of financial comfort, those worries at least recede. Having too much money however can increase stress in your life. I am not to that point yet, but many very wealthy families worry about the safety and security of their members. They wonder how they can protect their children from kidnappers; how to best protect their multiple homes and fleets of cars or planes. They worry about what their money is doing to their children’s ability to attain self sufficiency and to find self-fulfillment without the requirement to go get a job to support themselves. You may worry about what your heirs would do with your hard earned millions. Will those you leave behind benefit from the inheritance you leave or will it hinder them? Will they squander it or use it wisely? Have you done enough to prepare them for a windfall? If you plan to donate it, will the organization use it for the purpose you intended, or spend it on perks for their employees? How can you best protect it from evaporating into the tax systems? Some days I wonder if I should just go ahead and spend it myself! Most days I try to do some preparation with my sons, daughter-in-laws and grandchildren – to help them learn financial concepts and acquire the ability to wisely manage their money. There is an old adage that states ‘shirtsleeves to shirtsleeves in three generations’, meaning that the first generation earns it, the second husbands it fairly well, but the third loses it. That is one reason I hold my Grandma Rie’s Money Camp each summer with my grandchildren (our third generation). Their parents are doing better than I did in teaching offspring personal finance, but I vowed to do better with my grand-kids than I did with my kids and so, try to pitch in and help teach them. I’m not super rich (like the folks Robert Frank reports on), but even if I were, I couldn’t always have everything I wanted. You can have some of the things you want all of the time, or all of the things you want some of the time, but you will always have to make choices about what to do with your money, just like you do before you achieve wealth. What lessons did you learn after your wealth increased? We’re not here yet, but aiming for it! I think when a lot of people think of being millionaire they think of all that as liquid, and can’t really conceive that while it is a big number, it’s still a finite number. When leaving for a charity, would establishing an endowment help in the allocation of funds? I’m no expert on endowments, but I believe that there are tax benefits in donating the principal to fund the cause of your choice. Plus, I understand that the organization accepting the money usually commits to keeping the principal intact, just using the interest and dividends for your cause. I’m thinking that the allocation part comes when you choose the cause and set up the endowment. Very very interesting to read your post! My husband and I are still in the scrimping, dreaming stage. But we do wonder how we could ever not want to be frugal. We had yet the courage to ask a crumb saver turned millionaire how life changed for them, so thank you for sharing so genuinely! I think I’ve said this before, but I believe and have experienced that the ‘getting’ is more fun than the ‘having’ – so enjoy your dreaming stage! I am a millionaire and my financial life is not complicated. My funds are all in a Fidelity account, even those funds from other companies. I deal with one advisor once or twice a year. I rebalance at the first of each year. All dividends and capital gains go into a cash account which I can draw from and reinvest any cash not needed. and you probably have a more complicated tax return and perhaps sometimes you worry about having all your eggs in one Fidelity basket….? Sorry to hear that. I hope you find an acceptable solution! 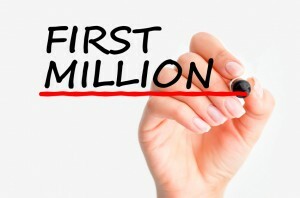 First million and there is no certainity of that happening – however chances are even. I don’t suffer with questions like ‘who’d inherit my wealth’ I guess none of us own anything-we acquire it by various tricks and deceit-definitely exploiting some or the other (natural resources or people). I would leave my wealth for some poor/middle class family so that they can enjoy the life of a rich, may be give good education to the destitutes. I have no qualms about leaving work and finding something more fulfilling – like writing or photography. I guess we are all wired differently and to pass on the money to next generation is boring, old fashioned. If you do have kids-give them good education and let them earn their life. Because that’s how you make experiences. I too believe that kids should learn to earn their own way. Passing wealth along to family can be a way to either remove all of their ambition or provide a base from which they can spring to bigger/better accomplishments. What a great post, it brought some things into perspective. Million is a huge number, but not unreachable. I have been reading The Joy of Skinny: Finances. It’s by 2 ladies, Aylsworth and Manchester. skinnylivingproject.com is their site. They have some practical everyday tips that can help you get going towards your “million”! Small things that can become saving habits are worth a try.